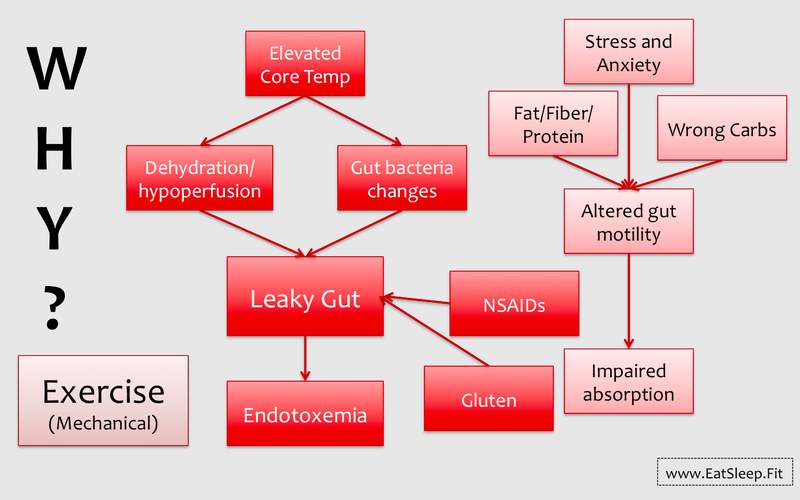 In part 1 we talked about the potential causes of GI distress during exercise, now let’s look at some solutions! 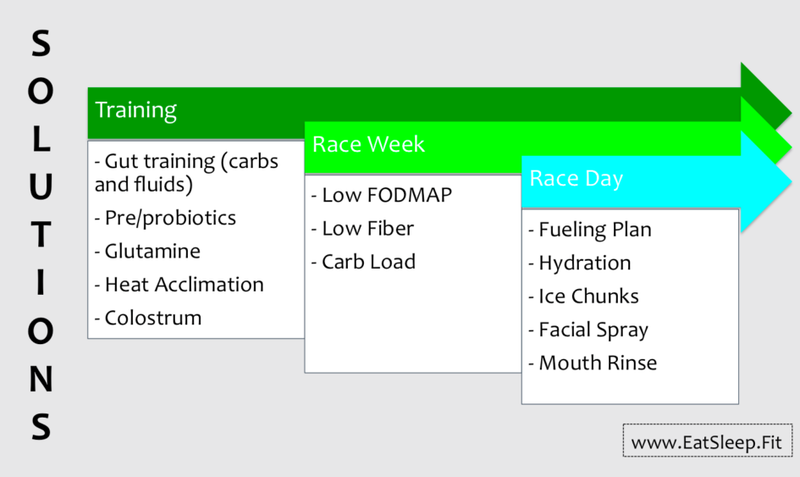 I like to think of these strategies in three distinct categories; things we can do over the course of several months during training, things to do during race week, and race day itself. Gut Training – If you don’t train your gut to absorb fluid and carbohydrate during exercise, it won’t be very good at it. Using our taxi example from part 1, if there is never a demand for taxis then there won’t be very many around and our absorption capacity will be limited. If we look at former marathon world record holder Haile Gebrselassie’s intake during the Berlin Marathon when he ran 2:04:26, he consumed about 8 oz of sports drink or water with a gel every 5 km (which for him was every 15 minutes). That adds up to over 1 liter of fluid and roughly 80 grams of carbohydrate every hour! Try taking that in while running a 4:45 per mile pace – it’s nearly impossible to do without a lot of practice. This idea is supported by recent research showing that the ability to handle large amount of carbohydrate without GI distress is improved with practice. The Right Carbs – As we looked at in part 1, our bodies can absorb a certain amount of glucose and fructose per hour. If we consume more than that we run the risk of GI distress and if we consume less we may not be optimizing our performance. A recent study in trained cyclists looked at the effects of varying amounts of glucose and fructose consumed during two hours of steady state cycling followed by a 30-minute time trial. As we can see, any amount of carbohydrate consumption will improve performance over water, but there was a sweet spot of 90 grams per hour (60 g glucose and 30 g fructose) to result in the best performance. Supplements – There are several supplements that can improve gut health and reduce the risk of GI distress during exercise including probiotics, prebiotics, glutamine, and colostrum. I will avoid recommending specific types or amounts here as these can have far-reaching effects on your health and should be discussed on an individual basis. 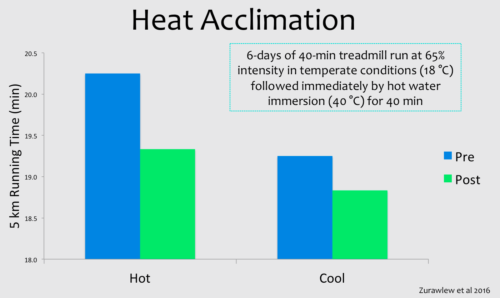 Heat Acclimation – This is a hot area of research (no pun intended), with performance benefits that are seen in both hot and cold temperatures. There are several ways to follow heat acclimation protocols including exercise in the heat, sauna use, and hot baths immediately after exercise. This graph shows improvements in 5 km running time in both hot and cold environments after six days of post-exercise hot water immersion. Again, this is something that requires individualization and careful monitoring. 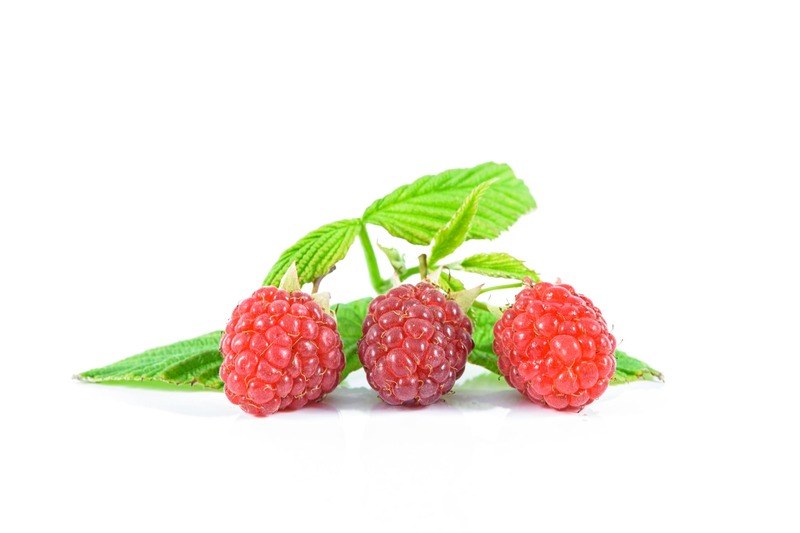 Low FODMAP Diet – FODMAP is an acronym that refers to certain types of carbohydrates that are fermentable, and diets that are low in these have been beneficial in reducing IBS symptoms. While it’s likely that not all people need to reduce these foods, there is some early research showing that runners who experience GI distress during exercise may find benefit in reducing these foods during race week. Low Fiber – Fiber is great for our health, except during the 1-2 days before a race. Fiber can hold water in your GI tract and is linked with increased GI distress. Choose white bread, white rice, and skip the salad! I do make exceptions however, for high-nitrate veggies like beets, celery, radish, and spinach. Carb Load – This is well known to improve performance, and can be beneficial in reducing GI distress during exercise if done properly. To give you an idea of what this looks based on your individual body weight, I made a calculator that you can use (enter your body weight in the yellow box). I also include how many bananas or how much rice you’d have to eat to attain that number of carbs, but please don’t carb load solely with bananas or rice. 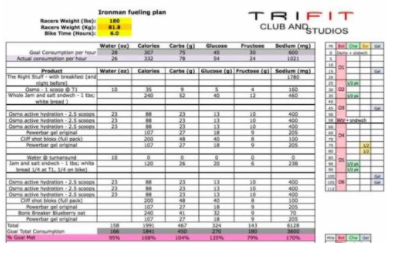 Fueling Plan – I’ve written before about the performance benefits of following a fueling plan. Think about the amount of time invested into training for endurance sports (at any level), along with the amount of money spent on race fees, travel, bike transport, wetsuits, cycling gear, running shoes, etc., etc., etc. 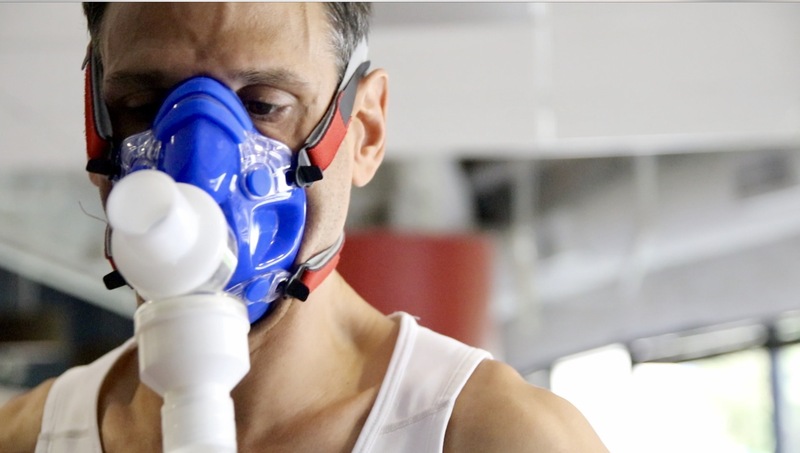 Despite that enormous commitment of time and money, many people still choose to go into a race without an exact plan for their fueling based on the best scientific evidence that they have practiced repeatedly during training. My clients go into races knowing exactly what to take in throughout the entire day, along with an understanding of how to make changes on-the-go as race situations change. Cooling – Cooling your body is critical during a race. Sweating is the main way our body off-loads heat, but there are several other strategies like swallowing ice chunks (ice pulls more heat out of your body than cold drinks) or spraying water on your face (which can lower our perceived heat stress) that can be beneficial during extended exercise. Mouth Rinse– Not just for wine tasting. 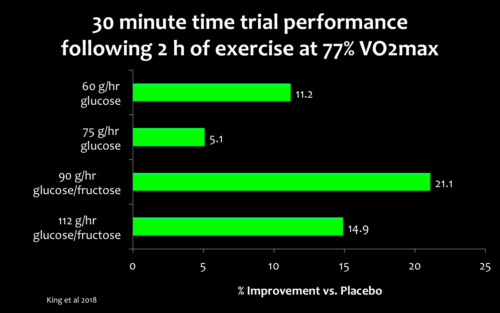 Believe it or not putting some carbohydrate in your mouth during exercise, rinsing it around for about 10 seconds and then spitting it out can actually lead to performance benefits! This may be more of an end-of-race strategy during a long course triathlon, where your GI tract can’t handle anything else but you still want an energy boost to get you to the finish line. 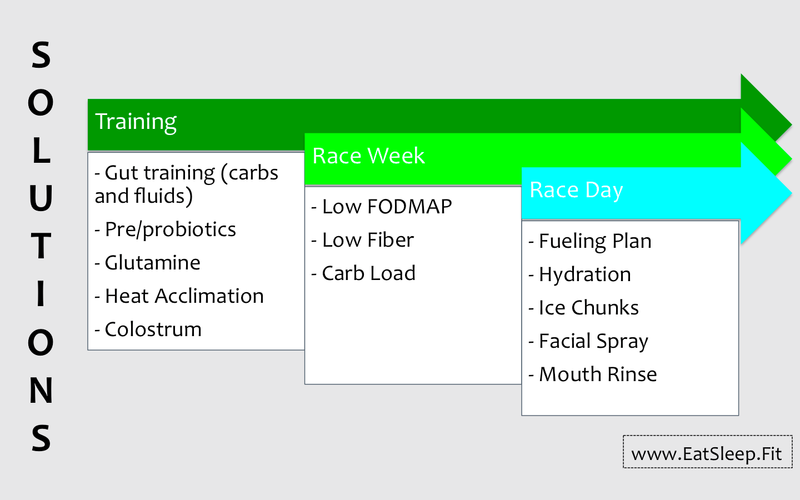 As you can tell after reading these last two posts, there are so many factors that can contribute to positive or negative experiences on race day. Not all of them will apply to you, but if you struggle with GI distress during exercise these are all areas worth looking into. 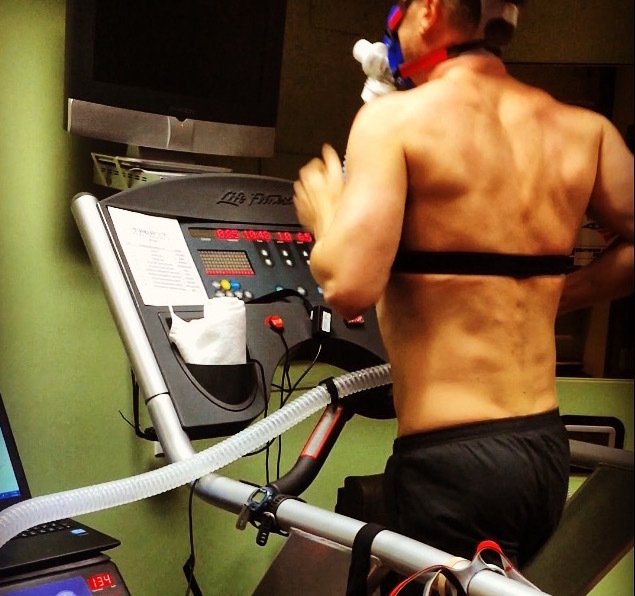 My job is to help you train and race more effectively, more efficiently, and more enjoyably. I’ve helped champions, competitors, and people who just want to finish their first race. Each situation and each individual offers a unique challenge and a unique satisfaction when success is achieved. Click here to schedule a free 15-minute phone consultation to chat about what you’re currently doing and if a nutrition plan would be a benefit to you, with no further obligations. If we are a good fit and decide to work together you can schedule with confidence because all packages come with a 100% satisfaction guarantee. At the end of our first session you will have a clearly defined plan and an understanding of why the plan has been created for you. All of your questions will be answered, both the questions you may have coming in as well any new questions pertaining to what is discussed. If you buy a package and at the end of the first session they don’t feel like you’ve gotten at least $1000 worth of lifetime value or are not satisfied in any way from your session, I will happily refund your money. Click here to schedule you’re free call.